Today I've got a Norwegian brewed German style sour beer for you. 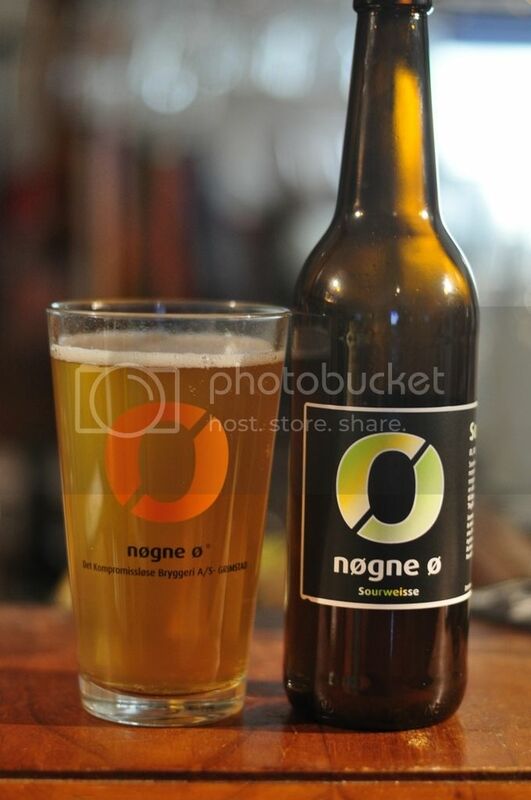 Nøgne Ø is, in my mind, one of the best brewers in the world. Simply flick through the Norway tab to see some of the many beers of theirs that I've reviewed and enjoyed. A Berliner Weissbier, is a sour wheat beer which has been inoculated with a lactobacillus culture. This should be a real treat. Here Come the Vikings may have taken the mantle of my favourite Untappd badge artwork. 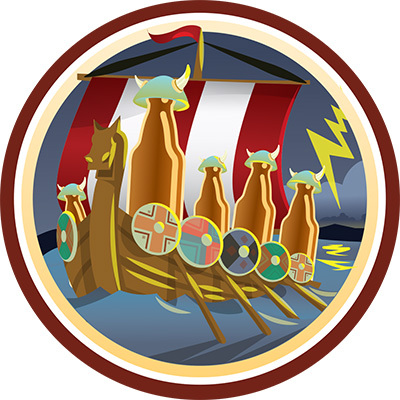 This badge is awarded for drinking beers from Norway, a country which produces a large amount of craft beers that make it to our shores. Alongside Nøgne Ø, we also get great stuff from HaandBryggeriet, Lervig and I'm sure there's others. You'll be seeing plenty more levels of this badge in the future. Sourweisse pours quite an interesting light hazy yellow colour. The head is small to start with, maybe just over a finger high, and fades to nothing within minutes. While it isn't a traditional looking beer, it is perfectly within the style guidelines and looks enticing. The lack of head would normally indicate lack of carbonation, but with this one I can see lots of tiny bubbles rising to the surface. Onto the nose and at first I didn't get many aromas at all. There was a little bit of lacto tartness, a touch of lemon and some very light wheat and biscuity malts. As it warms up all of these become a little stronger, but no new elements become obvious. The beer tastes surprisingly balanced for a sour, there isn't enough tartness for me. The wheat and lemon flavours are complimented by some other citrus flavours, orange peel in particular, and a little bit of malt. But the really noticeable element missing here is the tartness. The carbonation is slightly above average and it has quite a spritzy mouthfeel. I can't recall a Nøgne Ø beer ever underwhelming me before this one. It wasn't a bad beer, don't get me wrong, it just wasn't a particularly good beer either. I think I can see a role for it for a hot summer's night, but I can also think of a number of other similar beers I'd prefer over it. Don't let this put you off trying it; if you go in with an open mind you may find you enjoy it, after all beer opinions are all subjective! Cheers guys, keep the emails coming! I hope I will have got back to you all by the end of the weekend!